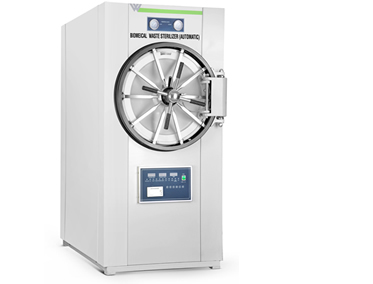 Autoclave is an asset to Hospitals, Pharmaceutical, Tissue culture, Bio-fertilizer Laboratories and research institutes with modest sterilizing needs, where contaminated objects require sterilization. This Autoclave also known as Vertical Autoclave. The outer chamber is made of thick gauge Mild Steel while inner is made of 304 grade Stainless Steel. Lid is made of Mild Steel with inside lined with S.S. for double protection. The unit has Radial Locking arrangement for the lid. Provided with built-in safety valve, pressure guage, pressure release valve. Pressure is adjustable from 5 psi to 20 psi ± 3 psi. Supplied complete with cord, plug etc. To operate 220 volts single phase 50 cycles. Electrically heated by special flange type/immersion type heaters bearing ISI mark, to work on 220 volts single phase 50 cycles. Double safety radial locking arrangement. Water inlet and water valves. Automatic Pressure Control Switch - This semi-automatic device controls the pressure inside the chamber mechanically and cuts-off the current from the heating elements, when the desired/ set pressure value level is attained inside the chamber and restarts the mechanism once the pressure inside the chamber falls from the desired level. Automatic low Water Cut-off Device - This device is a safety device which protects the heaters from running dry. This device ensures that the machine is automatically switched off in case the desired water level falls below the prescribed level. Mechanical Timer - This is a semi-automatic device which is initiated once the pressure level inside the chamber reaches the desired value, it regulates the sterilization time of the media to be sterilized and when the desired time is passed, it activates the buzzer, which indicates that the sterilization cycle is complete and media can be extracted.